Description: The great horned owl is a large bird, reaching 52-60cm (20.5-23.6 in) in length with a wing span of 91-153cm (3-5ft). While the plumage varies in each sub-species, they are all a combination of brown and varying shades of black and buff. Several feathers are white in color, especially under the chin. As well, they have large yellow eyes, a large beak and claws, and toes that are completely covered with feathers. 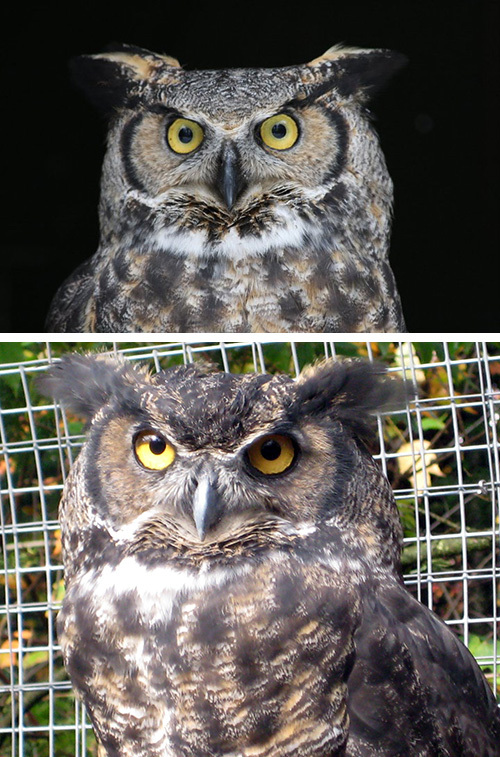 Distinctive to great horned owls are the two feather-horns on their head. 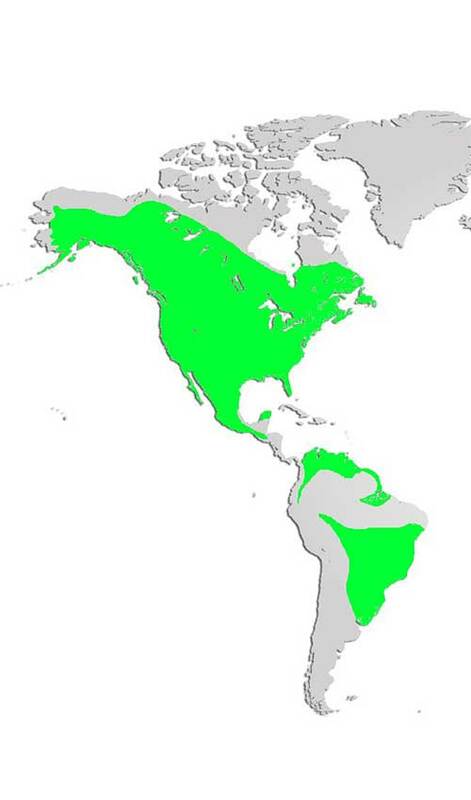 Distribution and Habitat: Great horned owls are found throughout North and Central America and in parts of South America. They prefer forested areas and are not often found above the tree line in mountainous regions. They typically use nests abandoned by crows, hawks or eagles, and consist of a platform of sticks lined with dead leaves. Occasionally, these owls use natural tree cavities. Diet: Carnivores, who hunt primarily at night, great horned owls feed on snowshoe hare, grouse, crows, skunks, and porcupines. Life Cycle: After laying 2-3 eggs, great horned owls incubate them for 30 days. During the nesting period and before the chicks fly, which is usually around 10 weeks of age, they are fed and protected by both parents. Adaptations: All owls have special adaptations for night hunting. Their eyes can function in low light conditions and their hearing is amplified by the shape of their head. The leading edges of their flight feathers have a frayed edge that allows them to fly virtually soundless. Did you know? Great horned owls apply at least 300 pounds per square inch (psi) of crushing power in their talons! The birds of prey at the Shubenacadie Provincial Wildlife Park were received with permanent injuries and cannot be released back into the wild.